Manish Jalwal presents a decorative vase steeped in the artisan traditions of jaipur, home of the pink city. 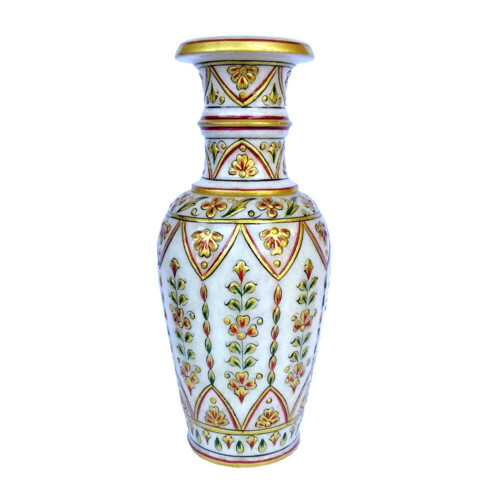 Crafted of fine Makrana marble, the petite vase is painted by hand with luxurious gold work . Faceted beads add sparkle. Please note: As it ages, Makrana marble may develop an ivory or yellowish tone. The art object is a handcrafted piece of marble,which has a pure gold leaf on it. This art has its origin in the royal city of jaipur(rajasthan,india). are further embellished with pure gold and modern dry colors and in the end whole piece is lacquered. Why choose Prem Arts Products ? within 24 hours.They could also offer professional advice to meet your satisfactory. 4–Quality Control:Our QC will check products pc by pc before packing. 5–Timely Delivery:We always send out containers within agreed time.